Radu (ANDERS HOVE) has been destroyed, and Michelle (DENICE DUFF) has been captured by Radu's vile mother, Mummy. Mummy uses sorcery to bring Radu back to life, then magically transports them back to Castle Vladislas to escape their mortal pursuers: Michelle's sister Rebecca (MELANIE SHATNER), Mel Thompson of the US Embassy (KEVIN BLAIR), and Lt. Marin of the Bucharest police (ION HAIDUC). Radu's obsession with Michelle undermines his power over her. She manipulates him into teaching her the secrets of vampire existence and how to harness her vampiric powers. Once she learns to survive on her own, she intends to destroy him. But Michelle's plan is thwarted when Rebecca storms the castle with the help of a CIA operative armed with an arsenal of silver bullets. Driven insane by Mummy's demands and his weakening hold on Michelle, Radu makes a fatal mistake that leads to a climactic standoff on the high walls of the castle. First there was SUBSPECIES (1991) a vampire flick actually filmed on location in Transylvania. This one concerned an attack by, and eventual subduing of, high-tech bloodsuckers. In BLOODSTONE: SUBSPECIES 2 (1993) surviving vampire Radu (Anders Hove), in concert with his repulsive mother, decimates the Rumanian countryside. 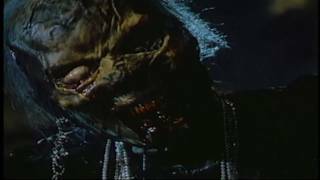 The story is further elaborated upon in BLOODLUST 3: SUBSPECIES (aka BLOODLUST: SUBSPECIES 3). This time, Radu goes after Michelle (Denice Duff), who's successfully thwarted him in the past. Michelle learns that Radu's plans go far beyond Transylvania-he must be stopped for good!